Somaderm HGH New U Life New U Challenge, my Make Money from Home website ranks so high with this so called opportunity and anti-aging product. I have written 4 separate articles about the topic and I share the side effects, the reviews, the testimonials, the risks, the benefits, the compensation plan, the history of the person who created the New U Life & New U Challenge. Alex Goldstein, who not only created New U Life, he also previously created Strike First Nutrition ...... New U Life is simply a relaunch of Strike First Nutrition. Should I promote the "opportunity" and product? If I did, I would most surely break my $213,000 record for earning in a year, but no, I don't promote the product and/or so called opportunity. I do rank very high for and also have very much traffic for the keywords, New U Life, New U Challenge, Somaderm, HGH, Side Effects of HGH, New U Life Review etc..... and very many others as well so, Yes I could earn many dollars from the opportunity. What stops me from promoting the New U Life opportunity as well as endorsing the product? I have never and do never plan to share anything that is not legitimate, in the event that I have, I have created a post about my shortcomings. I pledge to You all that I would never promote anything that I don't truly believe in and yes I believe in the Wealthy Affiliate site and opportunity as well. What are some of the so called opportunities that you have heard about recently & consider a scam? Hi Tony, I must admit to being guilty of someone recommending a product or system, telling me all I have to is pay a small amount to get started, promote this get some people under you and you will make money. So off I go without any real interest or knowledge of the product or what it can do, low and behold something amazing happens, the product or system disappears into the either never to be seen again, my reputation goes with it and I am left high and dry like a grounded boat. Thats all now in the past, finding WA has been a real change and I can thoroughly endorse all you say. Honesty will always pay off! I agree to use the product or service before you can give a honest review. I respect your morals. I won't review anything I haven't experienced personally. Thanks Tony, I know of a few buddies who love the Somaderm HGH. i too, do not promote anything I have not used. This looks like something I WILL try and would work well with my wealthy-healthy niche. Best of luck and much success to you this year and beyond! I don't promote the product and/or the opportunity my friend. 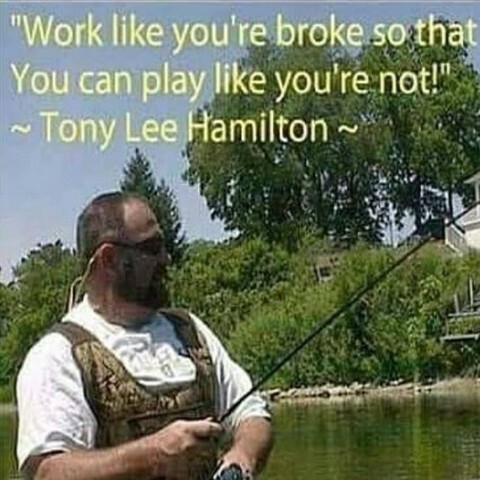 Great advice to follow Tony. Thanks for sharing. You are welcome Raymond and thank you my friend. I applaud you. I came across a website in the Site Comment area where it was a new website. For one thing, they didn't delete dummy pages and create a new post because the url of the post ended in hello world. And they were promoting a scam, saying they did research and it isn't a scam, etc. It was for some weird rideshare company who's app 'hasn't launched yet'. I went to the about us page, and it was set up like a scam itself as they wrote about the website NOT the person behind the website. I started to give a comment I knew was not going to be approved explaining scam sites often scam affiliates too, and list the 3 reasons it was a scam. Then since it was promoting a scam, the about us page was so generic except how trustworthy this mysterious people running the new site. I just reported it. I don't know if they want us to report sites that look suspiciously fishy or not, as I had to use Other, and I suspect the creator was just one of those people wanting a quick buck fast with little effort (the site showed the dummy comment instructions), but I wasn't going to ruin my approval rate on a scam site trying to educate a person who wasn't going to listen to me anyway. So my question, as you've got the same ethics I do, what do you do when you see people setting up scam sites? Btw, I agree with all these health fads. It's not that I doubt that they have some value for some things, but they promote these natural items as cure all for freaking every ailment ever. I sometimes wonder if it's just a placebo effect for a lot of it. that is indeed a slippery slope my friend. In the case that you mention above, I would most likely comment with questions more than simply being negative as there is a great chance that I may not already know all of the facts. One thing that I have noticed within the site comment platform is that many people who comment, mention Wealthy Affiliate & try to compare the sites with WA, even though they aren't anything similar. Placebo, yes, I do myself feel that many do have that effect indeed Rochelle. I remember commenting on that member website in Site Comments. I saw the template stuff still on their website so I assumed it was a new WA member eagerly going thru their lessons and putting it up for comment as per the tasks set. I personally do not know if the opportunity it is talking about is a scam; it could very well be a legit start-up being promoted by a newbie who hasn't taken off the training wheels yet. So as it was possibly a new WA member, I gave it the benefit of the doubt and just commented on the surface of it. No judgement. If it is a scam, that person will soon find out. If she/he happens to be a scammer, well he/she's not a very good at setting up websites so their credibility is lost ... so things will work out the way they should. In the meantime, we continue to support fledgling members. Thank you Cath for sharing your thoughts as well my friend. I'm still a fledgling myself and a quick Google search made me quickly realize it was a MLM with very poor management at best, pyramid scheme, or straight up scam. They claimed to have launched but no app. They charge you to be an influencer? So they charge you for promoting them. They charge you to be a driver. But it hasn't launched, despite claiming since November 7th to be two weeks away and no one seems to find any insurance any ride-sharing company has to have, I guess. But my concern was whoever made the site actually paid to be able to earn referrals and yet, couldn't find whoever made the site to PM them or email them. Admittedly, with the errors it was a newbie totally, and was going to try to help. But reported so maybe an expert can since I tried to find an email or a name from the website, anything to message them. It was completely anonymous site. There's supporting newbies, and then there's straight up patting them on the head for breathing. I'm supportive if there's effort or anything, but I don't ever lie to people and say good job when it wasn't. I'm always polite. If you notice, I didn't post the site anywhere because maybe he was trying or something, but it didn't look like it and claiming something you can't back up. Even if I don't like it I'm polite. But it's a bit obvious they are rushing and not being entirely honest about his extensive research. I refuse to just praise everything. That's just as dishonest as claiming to have researched scam claims that took me one search to find multiple articles on front page. I even read the articles myself. I'm supportive, but I'm not going to baby anyone for shady stuff, even if the owner doesn't understand why it's shady. I'm not posting it in case the owner wasn't trying to be deceptive or promote scams. But a mattress blogger got sued for using false reviews of items they never slept on. No one needs to be sued. That's how I'm supportive. With honesty and try to protect people. But couldn't message him. Going to let support do it. To be frank, I do not have the energy to check out someone's program on Site Comment to the extent you did. So I just took it at face value and within the context of the Site Comments platform. But I would indeed value your level of input on programs out there if I were looking into them. Which brings up a great idea ... perhaps WA should have its own version of TrustPilot type of section where members can share their thoughts on the trustworthiness of a program. I like it that you felt strongly enough about a program to actually think twice and three times about it. To the extent that it conflicted from the task at hand. And if you have sufficient points to make on it, putting it in a TrustPilot section of WA will be one way of discreetly guiding people to rethink their programs and choosing ethical ones. It will also go a long way to putting a dent in scammers' efforts. To be honest, I don't do that with every program. Just the ones that sounds totally messed up. I'm a little OCD about it too, if I Google it, I read the articles because people sometimes claim it's a scam for BS reasons that are typically their own fault. So I read it to be sure it isn't the same as people claiming it's a scam because they expect magic or they broke rules or whatever. But your idea has merit. Have some sort of tool or team willing to help people determining scams or shady stuff. I'm usually pretty good at spotting fishy stuff. There are articles which blame that on anxiety, which I have (as my previous totally rambling post showed, I was having a bad night). But don't know why I've always picked up on it. Even in person. I just do. I'm not always right, but it's usually right. Whether you turn out to be right or wrong, your voicings are cautionary and worth noting. I just don't want people scammed, affiliate marketers get scammed too. People understand people scam, but for some reason, no one believes they can be scammed. It's why you always see the 'I've been hacked' a lot. It's usually a victim of a scam, probably a fake email with a link to a dummy login page and people try signing in or the zillion other ways they convince people to give out information. So I speak up in cases where money might have been exchanged. And for anyone reading this, pay attention to urls. Don't click on any email without checking what email address it came from. (Facebook comes from Facebook.com, Amazon is amazon.com, etc) And never give money out for any reason unless you are purchasing something, domain, hosting, subscriptions where you immediately get something back, not on products 'in process' or 'launching soon'. And no legitimate customer service people ever ask for login passwords, those are never accessible to customer service agents, they are kept encrypted by the system. They verify identity by other means, email, secret question, or address or phone number, or the last 4 digits of ssn or credit card, as those are usually encrypted from agents too. I'm saying this because starting an Internet business means way more exposure online and way more scams try to get you. :) Gmail spam filter is decent but not foolproof. And we are pretty much shouting our emails all over the place starting our sites. Got a fake Facebook email just yesterday, not in Gmail spam folder either. I appreciate your "morals" and your vow not to post anything unless you consider it legitimate. I believe that is an excellent stand on your part. However, I have to question one thing. Is CBD one of the things you call not legitimate? I can differ with you there, from my personal experience. I've used CBD oil for 10 years, and have had so many benefits from it. It is an incredible pain reliever for arthritis, for one thing. Not telling you what you have to like, just telling you my experience. I to use CBD oil from a reputable source, researched a lot and have had success with it for my fibromyalgia. It is pretty amazing stuff. I'm glad it is finally being recognized as a legitimate healing substance. no, I am not saying that CBD is one of those things that are not legitimate my friend. I am saying that "Right now, I have also noticed that many are looking into CBD, Forex Binary Trading, Crypto and so many more including the New U Life New U Challenge Somaderm HGH Gel ......"
Thank You DA, I do have many other friends who also love using the CBD oil as well my friend.